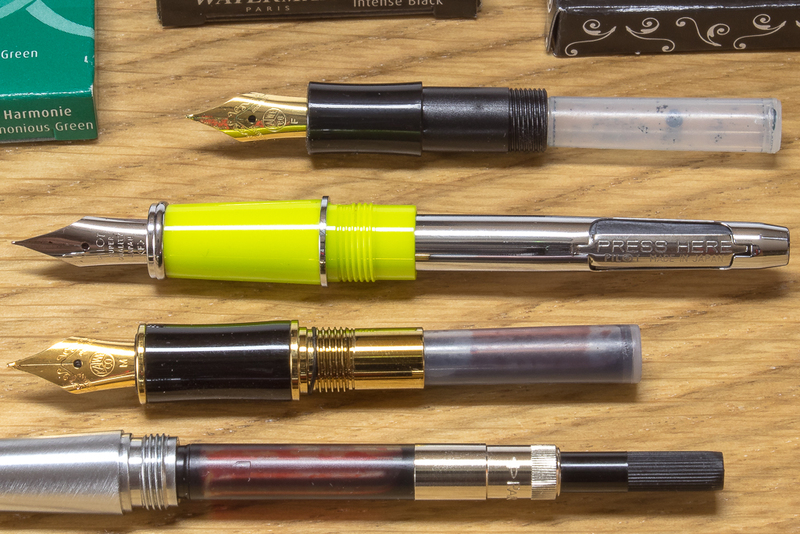 When it comes to choosing a preferred method of ink delivery for your fountain pen, the question of whether to use a cartridge or converter is a tricky one to answer. Some fountain pen manufacturers such as Noodler’s Ink don’t give you a choice. You are stuck with a piston or plunger converter that is integral to the design of the pen. Other manufacturers such as Parker, Platinum and Pilot require you to use a proprietary fitting converter or cartridge. Many pens such as Kaweco and Waterman adopt international standards. When you decide to write with a pen that requires a proprietary fit you may be limited to the inks that the manufacturer makes unless you use a converter and bottled ink instead of cartridges. International standard cartridges come in two sizes. The short cartridge is most popular and comes in at 38 mm end-to-end. The longer cartridge is 73 mm. Most pens will accept either. Many pens allow you to have a short cartridge fitted and still leave space to carry a spare in the barrel. This design guarantees that you don’t run out of ink when you least expect it. So should you use a cartridge or a converter? There are two main advantages to using bottled ink and a converter over cartridges. Firstly price. Ink cartridges are more expensive than bottled ink. This makes sense because it is more costly to manufacture ink cartridges. The second advantage is the vast array of ink that is available to you in bottles. You can use any ink from any manufacturer. Of course a fountain pen converter means more mess when filling, and this puts some writers off. They prefer simply swapping an empty cartridge for a new one. While cartridges tend to be cleaner and easier to handle, don’t forget you should still clean and maintain your pen every so often. Some converters have a reputation for being a little tricky to use, and all of them take some practice to fill cleanly without air bubbles. 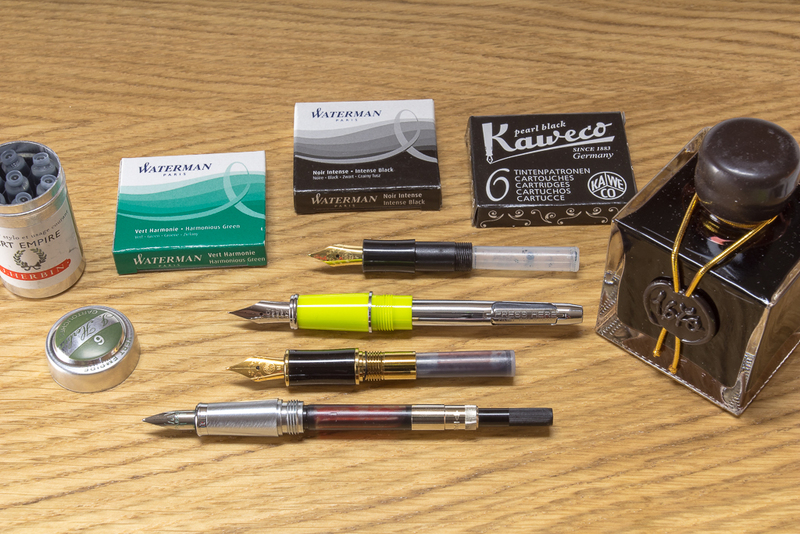 Most Kaweco Sport owners prefer cartridges over the squeeze converter because it’s a little tricky to fill. Perhaps Kaweco’s new Sport piston converter will help ease with this. Of course you can get the best of both worlds and use cartridges as well as bottled ink. How? When you finish a cartridge make sure you don’t discard it. Grab a syringe – preferably a blunt one – and inject water through the top of the cartridge to clean it out. Then use the same syringe and add a small quantity of your favourite bottled ink. Replace the cartridge on the pen and enjoy! Some pen enthusiasts prefer not to use a cartridge or converter at all. If you’re feeling a little brave then seal the threads of your fountain pen with a silicone grease. The threads are unlikely to leak but using a sealing agent such as the silicone grease found at a hardware store will almost guarantee it. Apply grease to the threads, remove the cartridge or converter, fill the long barrel with ink and screw the pen together. You will now be the proud owner of an eye dropper fountain pen. No converter or cartridge required! Whatever method of ink delivery you choose, be sure to try them all. I use a cartridge or converter depending on the fountain pen I am using. I have favourites for all. I use all these methods. A set of ink-refill syringes is so very useful, not only for refilling cartridges but also cleaning cartridges and pens. They generally fit perfectly Sheaffer fittings, which makes flushing a Sheaffer nib so easy. We often fill several cartridges for travel or work and cover them with scotch tape and store them in a small tin or baggie.